It’s that time of the year again when we start hearing all about how and why we should get our annual flu shots. Unfortunately, there are many people who are afraid to get these shots today. Typically, such fears are based on myths, half-truths, and fictitious ideas that they’ve either heard or read. Once these things are addressed and you understand why it’s a good idea to get your shot, hopefully you’ll be ready to make an appointment to do so. The flu: Since the flu vaccine is manufactured from an inactive (a.k.a. “dead”) virus it doesn’t even contain the flu virus. Instead, it contains DNA antigens so you may experience some soreness, redness, achiness, a headache, or a low-grade fever for a few days but this isn’t nearly as bad as getting the flu would be. Of course, for the first few weeks after you get your shot you could still get the flu, which is why it’s important to get your vaccine as soon as they’re available. Mercury poisoning: The vaccine is given with a single-use syringe or vial. It doesn’t contain any mercury or thimerosal (a preservative). Guillain-Barre syndrome: Fear of this disease elevated in the fall of 1976. Today studies show that the risk is one in a million. Flu shots don’t guarantee immunity, but they do reduce your risk of getting the flu by as much as 60%. Studies show that people who do get the flu after being vaccinated will suffer from symptoms that are much less severe. This should encourage you to get the flu, especially considering how bad the flu has been in recent years. Your body has a built-in, natural defense system known as your “immune system.” This helps keep infectious microorganisms out of your body and fights off any that do make their way in. Researchers from the University of Bergen in Norway conducted a study in this regard in 2017. They conclusively determined that this is false. In fact, they discovered that people who were vaccinated on an annual basis had a stronger immune system that was better equipped to ward off the flu. Unfortunately, this is misleading because tens of thousands of people die from complications they get with the flu. This is because the flu increases the likelihood that children and the elderly will develop bacterial pneumonia. Others die from an inflamed heart, brain, or tissues which results in organ failure. While flu shots aren’t “perfect,” they’re worth getting so you don’t risk getting the flu and if you do still get it the symptoms will be greatly reduced. At Countryside Hearing Aid Services we care about your health. 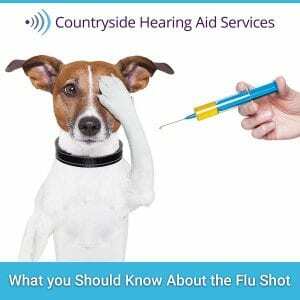 Not only do we want you to understand the importance of flu shots, but also of taking care of your hearing. Make sure we’re the next appointment you make after you get your shot this year.